You observe a kinda buss up truck slowly rolling down your street looking into your neighbor's house. You've nevah seen it before nor da drivah and as he steps out, he's looking around da property as if he's spocking it out. As he SLOWLY walks on property, he appears to be fake checking/calling his phone, puts it up to his ear, brings it down, looks around da front landing, puts his phone up to his ear for a couple seconds as if he was on a call, walks up to da front door but doesn't ring da door bell, looks around, fake checks his phone, walks through da open garage glancing at things, walks to da oddah side of house and to da rear of da home still checking things out. Wat are your impressions? Wat are your thoughts? Wat would you do? Da first two questions I'd say we all probably have da same general response but da last? Well dis is wat I did. BL: (walking across da street) May I help you? MOKE: (gives me stink eye) No. (very sarcastically back) May I help YOU?! BL: No, but wat are you doing looking around my neighbor's property? MOKE: (antagonistically) They called me here to do their yard. Why, who you? You live hea? BL: (didn't I just say I was their neighbor?) No, I'm their neighbor. I no tink they'd appreciate you looking around their property wen they no stay. It went back and forth for a while but really, why so angry brah? If you not doing anything wrong or if they were really "expecting" you, why so defensive? Basically his attitude was mind your own business but wouldn't you like a neighbor who looks out for you? Isn't dat da (ideal) concept of deciding wea to live dat your neighbors - not being niele - are helping keep you "safe" and got your back? MOKE: Go ahead, go call 'em. Go call 'em. BL: (no have their numbah) No worries brah. MOKE: Yeah, go get me. Go get me. Hea I stay! BL: No worries brah, I got you. Smile. MOKE: You like me throw away the carpet for you? MOKE: You like me throw away the carpet for you? I do 'em for a fee. Hint: If you like try get side jobs, it's not smart to ack up and be stupidly arrogant then ask for business. Wat a great morning as it first started out me forgetting to pack Da Baby's breakfast and lunch so I had to go back home to get it. Then aftah I dropped it off at da sitters, da bike battery was dead so I had to push da bike looking for a decline in da road so I could roll and jump start da bike. I go back home to charge up da battery and then run into dis "lawn man". Aftah all dat, I tell my oddah neighbor dat was cruising in her garage to look out for da moke and noticed I no mo' gas too. 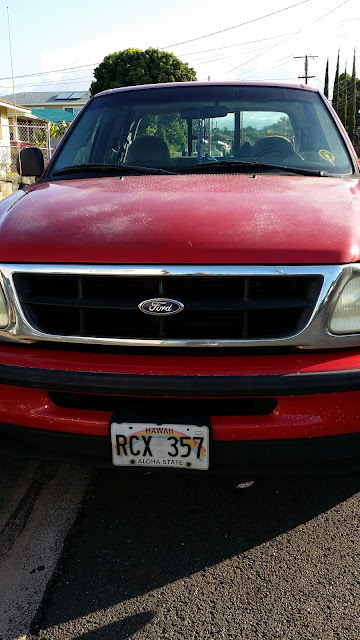 Aftah I pau fill up gas, I called 911 non-emergency to report suspicious behavior on private property...... and was placed on hold for wat seemed like an eternity even though da recording kept telling me "someone will be with you [me] shortly". 🙄 Aftah having inhaled enough petroleum fumes to make pakalolo weak, I hung up and headed into work as I was already choke late. Last week I was reading through a handful of articles about a five year old little girl named Talia and the months and months of brutal torture and heart breaking abuse she went through on a daily basis. Now having the wife (not biological mother) plead out to 20 years in prison and the husband (military soldier) found guilty in federal court, those are weak a$$ results since the punishment will never fit the crime even if the father is sentenced to death. That's actually the easy way out. What I'm wondering since it appears that all the abuse was happening on base housing - no one cared to investigate? In an area that's "protected", regulated and enforced by strict rules, how can it be that MP's have only been called to the home once on a noise complaint? The way these two monsters were beating Talia, I can't imagine her taking it silently no matter how much she was probably told to shut up. With housing built so close together, are you telling me the neighbor's had no clue? She's been taken to the hospital hours after nasty beatings and the doctor's didn't suspect anything? Nobody noticed limps, favoring injured body parts, blood, cuts, swelling? I can't imagine the yelling was only once after being stomped on till bones cracked, being duct taped to the bed post and used as a punching bag by BOTH of the "adults" and that's just what was said in court. I can't imagine what happened that wasn't disclosed. She cried "No, Daddy" in the final beating but I can only imagine how many times those words were cried out in mind numbing pain. She cried it right before being punched so hard that her shoulder was dislocated before her head struck the concrete floor causing a seizure and subsequent death. My stomach is squirming and knotting up as my fists are clenched in anger. I have experienced many painful "beatings" from sports and accidents and as such have a high tolerance of pain but I can't begin to imagine what the poor girl went through and how much she had to endure. Yet I have to say that I'm glad that she died as there is no way that she should have lived the rest of her life with such pain and memory of such brutal acts and carry that load throughout. There's not enough medication, therapy or whatever anonymous group meetings to go to to overcome that. It would have been cruel to live a life where you know of nothing else but pain and torture. As adults we are experienced and knowledgeable about recognizing signs and getting help but as a five year old? She didn't even know that there was life outside her four walls. Call it twisted but I have to thank them all though. I went home and hugged my three year daughter till she whined. Then I hugged her again till she was mad. Call it selfish that I needed to let her know how much I love her and would never ever cause harm to her - or let anyone do so to her as well. I have to thank Talia for reminding me however angry I may get at things my daughter or son does, to get over it and no one, NO ONE, that cannot defend themselves or know what true love is needs to be showered with it instead of being blown by anger and pain. Sorry for sounding cynical but I don't believe that she's in a "better place" or "living free" as that's straight up bu!!$h!t. She should have been in a better place while she was here, not after she's gone. Mahalo for the reality check Talia. My daughter thanks you even though she may not know it - probably won't either till adulthood - but most of all I thank you for showing your strength battling through cruel intentions and I pray that my kids will be able to display the strength you shown when faced with life's challenges. No bring one knife to a gun fight. Das da case of dis review. As da name implies, they serve (focus) on breakfast food and I made a classic WWD! mistake of ordering....... lunch. I no get "invited" to sample these places. I no get reimbursed for meals eaten. 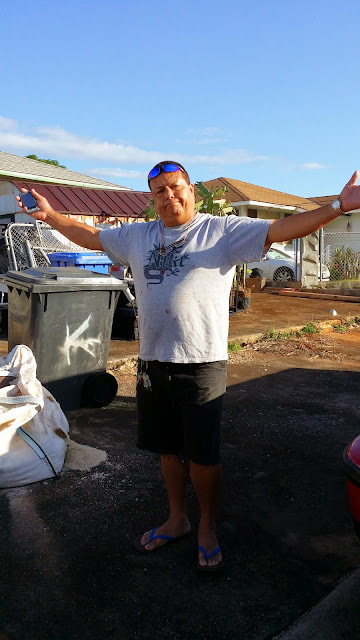 I no get asked/told by The Honolulu Star-Advertiser to check these places out so wat you get is a legit, straight up review from a local braddah who loves ono kanack kine grindz as much as he loves his beer. Typical no flash, sit your okole down, grind your grindz and pau. Da décor is not a let's take it easy and talk story and for wat it's worth, you won't feel like staying long anyways. It is busy in da morning - as expected - so wen we walked in during lunch time, it was fairly quick to order, grab a table and wait for our food. Da prices are a bit on da high side for wat they offer but again, dis review is about their lunch, not breakfast, but dat nevah mattah cause personally I nevah care for da grinds dat I had to ingest. I should have taken da hint to order breakfast food at a breakfast place but I wasn't feeling like breakfast so I opted for a plate lunch. Big mistake. Da chicken was ok - only one piece too, WWD!. Da meat juhn was edible. Da mac salad was "watery" (prefer da "thicker" kine) but I was especially disappointed in da home fries. Now das a breakfast type food no? I love potato kine foods but felt like I was eating.... starch. It wasn't seasoned at all which by da way their meat juhn and chicken was bland as well. There was absolutely nothing special about da food and da plain ole paper plate it was served on proved it. btw, we had it to go and it was wrapped in foil. I can't imagine their rent being exorbitant compared to places like Ala Moana or Pearl Ridge so to go as far as serving bland food on paper plates beats da heck out of me. 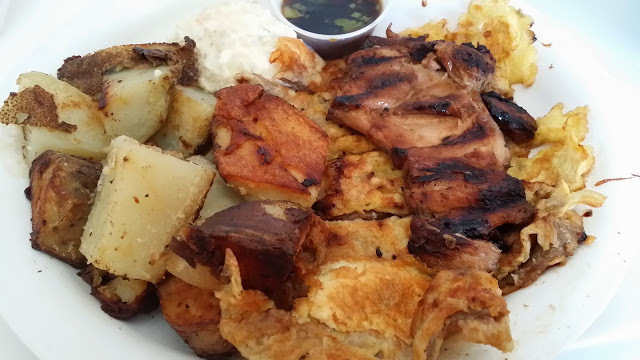 To be fair, keep in mind dat dis is a LUNCH review and not a breakfast review as I've had their breakfast albeit was a few years ago and from wat I can remembah, it was a lot bettah than wat I had recently. Da Chicken Or Da Egg? Maybe cause it was Easter coming up but two Saturdays ago Da Wife noticed something coming out of our car's okole. Ok, well not literally but close enough. DA WIFE: "Most wonderful man in the world, come check this out." BL: **BL dreaming he was da most wonderful man in da world... waking up** "Wat is it?" DA WIFE: "You gotta come see it." BL: "Wat da heck? 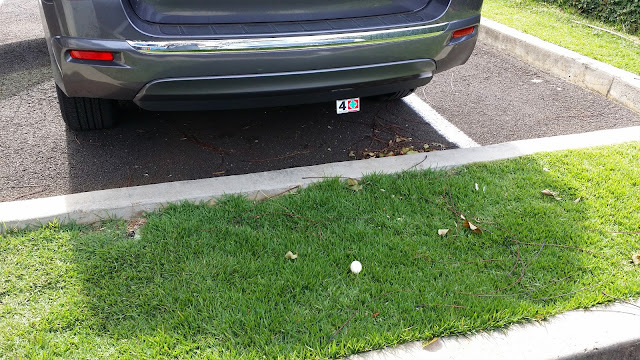 Is dat an........"
Wen we parked it wasn't there and we weren't gone more than twenty minutes so how/why da heck an egg mysteriously appeared and lay smack dab in da rear of da car as if it was laid by da bumper beats da heck out of me. I looked up at da tree to da side of us which was bare with no nest inside and it wasn't extremely windy to have caused any branches to sway wildly anyways. 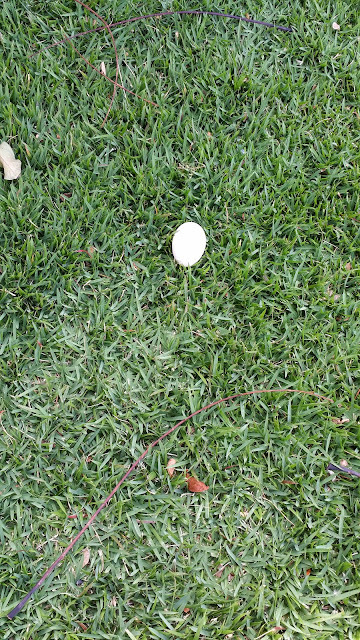 No chickens running around nor anybody for dat mattah as it was still early morning aftah leaving da doctor's office so how an itty bitty egg came to rest so symmetrically to da car and da grass area perplexed Da Wife but not me. C'mon, look who it's happening to? 😆 Dis kine of thing no phase me. 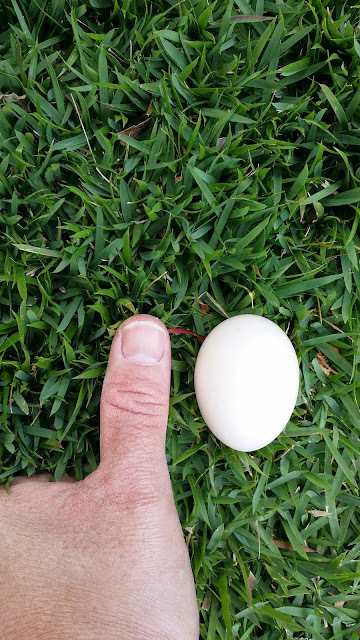 I thought it was strange dat it was such a tiny egg though. Got any ideas how it got there? Let's keep it clean as you wouldn't want egg on your face do you? Please don't feel like you have to scramble to tink of something. And no poaching! Dat was da last one - couldn't resist. Have an egg-cellent day. Ok, now DAT was da last one. First Target, then Nordstrom then watevah major retailer security breach it may be, we are literally at da whims of da most sophisticated hackers out there. From Thanksgiving to now it's literally a hurricane of checking your credit card statement for unauthorized purchases and then dealing with the aftermath of a possible identity theft scenario. Currently there's something going around called "HeartBleed" where it affects - to put it very simply for those not tech savvy - security of information. Naturally it's putting internet sites in a frenzy to protect themselves as it deals with login names and passwords. CNET has been so kind to compile a list of top 100 websites currently on da web, CLICK HEA TO SEE DA ARTICLE, as written by Jason Cipriani using Alexa.com. His article notes if the specific website has been patched (fixed) and lists if they've gotten answers to the question posed to the sites, "Have you patched the Heartbleed bug yet?" which is updated frequently. So if you visit any of the above listed sites, or any other for that matter, please check to make sure that the site is not vulnerable. Trust me, there's a website in da list dat I said Wassup Wit Dat! as it was in da top 100 of websites visited........ can you find it? Happy Easter and have a grrrrrreeeeeat Happy Feel Good Friday!